Bon chance, good luck...and success! For this the ninth consecutive on-target launch with Vega since its introduction at the Spaceport in February 2012. 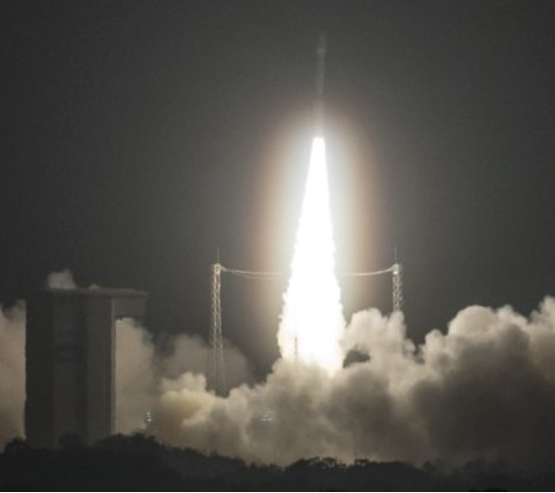 Today's launch marked Arianespace’s third liftoff so far in 2017 – during which the company is targeting up to 12 missions with its launcher family of Vega along with the medium-lift Soyuz and heavyweight Ariane 5. Tonight’s Sentinel-2B payload is a part of the Copernicus satellite system being deployed in the European Commission’s program to provide Europe with continuous, independent and reliable access to Earth observation data. The Sentinel-2B Earth observation satellite primarily focuses on monitoring land masses and coastal zones around the world. Its data will be used for applications concerning the monitoring of vegetation, soil types and habitats. The spacecraft features a multispectral, wide-swath, high-resolution optical imaging instrument. Sentinel-2B will be positioned in an orbit opposite that of Sentinel-2A to ensure optimum coverage and data delivery. The pair of Sentinel-2 satellites will cover the Earth’s entire surface in five days. This high frequency means they will capture brand-new views of the Earth, driving considerable progress in monitoring and predicting changes in vegetation and aquatic pollution. Sentinel-2B is the fourth Copernicus program satellite orbited by Arianespace, following the successful launch of Sentinel-1A on a Soyuz in April 2014, the lofting of Sentinel-2A aboard a Vega in June 2015, and the deployment of Sentinel-1B by a Soyuz in April 2016, all performed from the Guiana Space Center in French Guiana.